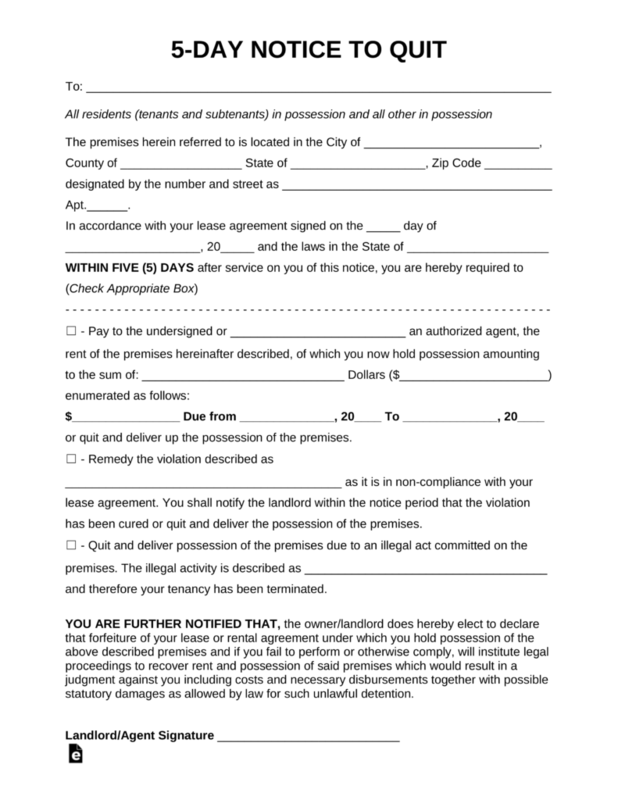 The five (5) day notice to quit is a form to be used, where applicable, to notify a tenant that they are in non-compliance with their lease due to a violation. The most popular is not paying rent on time, although the reason can be for any violation such as parking in the wrong area, damage to the premises or common areas, or any other condition that has been broken by the tenant. The form is typically given in person, through certified mail, or left in a conspicuous place on the resident’s property. Before sending the notice, make sure you know which type of infraction you are informing the tenant of and whether it requires five (5) days’ notice. The most common types are late payment, non-compliance, or illegal activity conducted on the property. 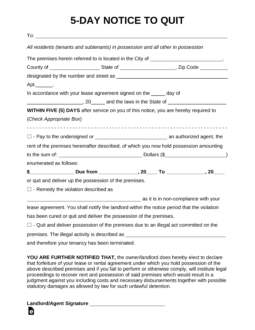 First Section – Enter the name of the tenant(s) on the lease agreement along with the street address (include City, State, & Zip Code) followed by the date when the contract was signed between the landlord and tenant. Late Rent – Enter the person who will ask the funds if tenant pays within the time period. Also make sure to include the final amount with any late fees and the periods for which they have not paid. Non-Compliance – If the tenant has broken the terms of their rental contract it should be described and the landlord/agent will inspect within the notice period to ensure the property in back in compliance. Illegal Activity – If the landlord has committed an unlawful act it should be detailed in this section and the tenant will have no choice but to vacate the premises at the end of the five (5) days. Certified Mail (return receipt) to the tenant. The notice period shall begin upon receipt of the document by the tenant.